With the flurry of announcements by Google, despite Hurricane Sandy, some news got burried in the avalanche of news. One of them was the roll out of Magazines and Movie purchases to Canadians. We are probably not the only country to get the change but it's certainly nice to see Canadians finally get access to more content from the Google Ecosystem. 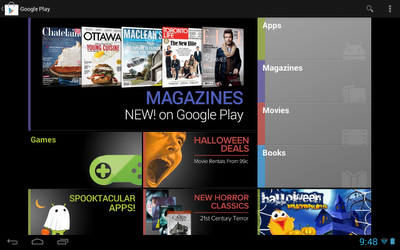 All we need now is access to Google Music and Canadians will have full access to the Google ecosystem. If you're an avid magazine reader and/or rather purchase then rent your movies check out your Android device or http://play.google.com.